My dear, that applies to women in general, any skin tone. and not blame those that appear to receive it effortlessly. And you don't even have to be a woman, of any colour, to have trouble with this one. We are all, men, women and children bombarded with the message that we must perforce be discontent with ourselves and our lives because we are not good enough. We must have, do, wear, eat, think differently to be tops. And even if we do that, there will be more messages telling us that we've still got it wrong. Good enough for whom? For those who want our money. Oh, yeah, like they care about anything but profit. And we all--men as well as women--buy into a fake "dream". But some time you have to wake up. I understand where you are coming from Connie. As a person of color, even I had to look at your picture again to notice that the issue was the dolls in this picture. This goes back to the Mamie and Kenneth Clark test in the 1940s. The tests, asked black children to choose between a white doll and black doll. The Clarks asked black children questions and found they overwhelmingly preferred the white dolls over the black dolls. The study's findings were presented in Brown v. Board of Education. This led to the desegregation of American schools. 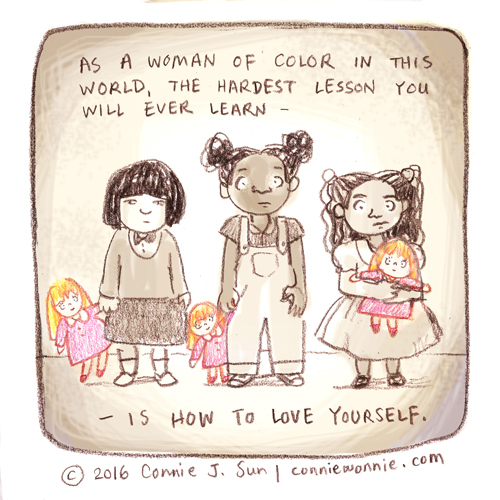 So, while I agree with the spirit of Jane, Kat, and even Anna, the image of what is considered beautiful could lead a girl of color to believe that she will never be pretty. We could even take this argument to beyond our shores where in Africa and India girls are bleaching their skin to appear more Caucasian. We could also go to reports out of Asia where parents are having their children's eyelids surgically altered(cut) to have their children appearance to resemble White children in the West. These examples do give weight to the argument that girls of color do go through issues that their White peers do not. I feel that it does not take away from anyone's struggle to point out that this is a major struggle for girls of color. @JaneZuroff That is very true, but your comment is unnecessary. You're derailing from the comic's true message, which is directed towards woman of color and represents the issues they specifically face. Instead of being offended by the artwork, you should just respect it.